Heading into the postseason, not once did the 76ers suggest that they expected to click their heels, and suddenly play like a club that’s had the luxury of time on its side. Saturday’s Eastern Conference Quarterfinals opener underscored that logic, as the Sixers ran into an opponent that was flowing on multiple fronts. Thanks to well-rounded play on both sides of the ball, the Brooklyn Nets took Game 1 of the best-of-seven series at The Center, 111-102. Brooklyn finished with a decisive advantage on the perimeter, hitting 11 3-pointers on 42.3% shooting. The Sixers, meanwhile, went an uncharacteristic 3 for 25 from beyond. Despite Jimmy Butler posting a playoff career-high of 36 points (11-22 fg, 13-15 ft), the Sixers had a tough time scoring the ball Saturday. Joel Embiid returned to the line-up, but his 22 points (5-15 fg, 12-18 ft) and 15 rebounds weren’t enough. 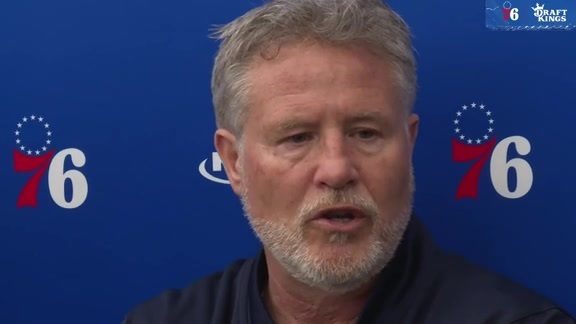 "That was a 'man,'" Brett Brown said referring to Butler, praising the wing man's toughness and "elite athleticism." All-Star D’Angelo Russell tallied a team-best 26 points (10-25 fg) for Brooklyn. It was the Nets’ bench, however, that emerged as a major X-factor. The group combined for 59 points, the collective effort highlighted by strong individual performances by Caris LeVert (23 pts), Spencer Dinwiddie (18 pts), and Ed Davis (12 pts, 16 reb). Behind a string of early free throws from Embiid, the Sixers seized a 22-19 lead midway through Saturday’s first quarter. Brooklyn responded with a 20-1 blitz that forced the Sixers to battle uphill the rest of the day. After nailing a 3-point buzzer-beater going into halftime, Butler brought the Sixers within three, 73-70, on an and-1 late in the third quarter. The Nets then proceeded to piece together another key spurt, outscoring the Sixers 20-12 to close the frame. Brooklyn maintained a double-figure lead for all but the final minute of the fourth. Boban Marjanovic finished with 13 points, three rebounds, four assists, a steal and a block, and was effective in his 15 minutes of play. Brett Brown was curious to see how Marjanovic would handle Brooklyn’s pace. The head coach was pleased with the outcome. Coming off an 18-point showing in Wednesday’s regular season finale against Miami, Marjanovic has now reached double-digit points in four consecutive games. The Nets’ bench proved to be one of the league's best during the regular season, and it came up large Saturday, scoring 59 of the team’s 111 points. The 59 bench points represented a franchise playoff-high. Atkinson said Ed Davis was a major piece of the puzzle. Caris LeVert’s 23 points in 23 minutes marked the team’s second-highest scoring total. In his playoff debut, D’Angelo Russell scored 19 of his team-high 26 points in the second half. After the All-Star’s slow start (scoring just two points in the first frame, and five in the second), Kenny Atkinson said he knew Russell was poised for a strong second half. Russell’s 14-point third quarter helped Brooklyn quell the rising Sixers, which narrowed the gap to two in the third frame. Game 2 tips off Monday at 8:00 p.m. at The Center, as the Sixers will seek to even the series.